Cheap energy is essential for human prosperity. Always has been. Molten salt reactors have the potential to deliver the cheap, clean and safe energy that is needed to lift billions of people out of energy poverty, without endangering the climate. At the Paris COP21 meeting, a majority of countries have decided to terminate the use of fossil fuels. The decision comes at a time that a majority of the world population is still waiting to share in the prosperity that cheap energy has brought to the developed parts of the world. Will those who live in energy poverty accept that they cannot use the cheap fossil fuels that the rich part of the world has used for centuries? Do they have to? Many have their hopes on solar and wind. But replacing fossil fuel will require a fifty-fold increase of their contribution. Many plans are published that claim it can be done. But can it be done? Will it? Should it? In 2007, Google took up an ambitious plan. Google believed that the most effective way to terminate the use of fossil fuels is by outcompeting them. Google’s RE<C plan was targeted at developing strategies to achieve this goal. After investing $850 million, Google terminated the program because it failed. In their article ‘Today’s renewable energy technologies won’t save us. So what will?’ RE<C project leaders Ross Koningstein and David Fork explain why they are convinced we need new technologies to outcompete coal. Of course, there is much more data to support the conclusion of Fork and Koningstein. The International Energy Agency’s Energy outlook 2015 states that even with New Policies in place, 65% of the world’s electricity is still being produced with fossil fuel. Placing all eggs in the basket of wind and solar increases the chances of a sustained victory of today’s big winner: fossil fuel. It looks like we have to choose between lowering CO2-levels and improving social justice. Unless we take a fresh look at present developments in nuclear. Over the last decade, molten salt reactors have become the focal point of a quickly growing number of business startups, researchers, and investors, supported by an also quickly growing number of supporters. Even though they presently only exist on paper, molten salt reactors have managed to create the first pro-nuclear grassroots movement since the early sixties. The enthousiasm can be easily explained: molten salt reactors have the potential to produce cheap, abundant, safe and clean power. Some companies claim this can be done starting in 2021. The key to the MSR’s techological advantages the liquid fuel. This technique makes it possible to take sixty to hundred times more energy out of the same amount of fuel. This brings the radical new perspective of cheap, clean, safe and abundant energy for all of us. In nuclear reactors as we know them, the fuel is solid. Present day reactors are engineered to be safe, and they are: even if we take accidents like Fukushima into account, nuclear reactors are by far the safest means of producing energy. But in many European countries, there is a strong but unfounded fear of radioactivity. Opponents have kept the industry in a stalemate for about forty years, leading to a virtually halted development. Within the molten salt concept, many designs are possible. Reactors can be optimized as load-followers that easily team up with wind and solar, and with energy demands that shift every minute. Basically, the molten salt reactor is a very simple device. The reactor core is a vessel filled with salt that is both fuel and coolant. 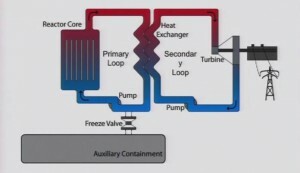 It produces heat that is quickly transferred to a secondary loop, that brings it to a generator. It works at ambient pressure and cannot explode. If no heat is drawn the reaction stops. If heat is drawn, the reaction stops again. In case of overheating, the ‘freeze valve’ melts and the liquid salt drains into safe storage. No operator is needed or could even prevent this. All radioactive materials are safely bound within the salt. It is walkaway safe. Molten salt reactors can be build in many sizes and are the perfect complement for intermittent energy sources like sun and wind. Their small footprint and flexibility are excellent for cities. They operate at high temperatures (650-800C), which is excellent for industrial processes. There are variations that can be efficient ‘waste burners’, that can run on spent nuclear fuel, of which we have enough to power the planet for hundreds of years. And they open the possibility to burn thorium, which opens the prospect of cheap energy for thousands of years. Two of the major startups claim their energy cost will be lower than that of coal. A well known design example is the liquid fluoride thorium reactor (LFTR) – this was the first to gather a quickly growing number of fans. In this reactor, the fuel salt runs through graphite tubes were the reaction takes place. The heat builds up while the salt flows: the molten salt is fuel AND coolant. The heat is quickly transferred to another molten salt that takes it to an electric generator, to power the grid. Because of their unprecedented energy efficiency, molten salt reactors extend the uranium scope by a factor 30 to 100, depending on the options compared. Once we start using thorium, which is a great fuel in molten salt reactors, we extend the scope again by many factors – leading to a very real prospect of cheap energy for tens of thousands of years. Welcome to a future of clean power for all! This website is created to quickly update you on recent developments and make up your own mind. It strives to counter confusion and desinformation, and hands you the info you need to start making your own judgements. – For how long can we power the planet, if we power it with molten salt reactors? 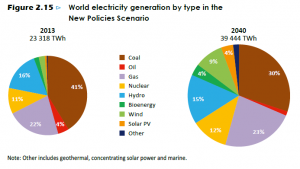 – Are ‘renewables’ like wind and solar not the only sustainable option? These Youtube video’s give you a quick update of the molten salt movement. This short and accessible six minute item was broadcasted on Dutch Public Television on November 5th, 2015. It features Jan-Leen Kloosterman, professor of nuclear physics at TU Delft and lead researcher of the European SAMOFAR project (Safety Assessment of the Molten Salt Fast Reactor) a €5 million European Union programme involving 11 partners from both science and industry. (For English subtitles, click ‘subtitles’ in the righ corner below; then choose ‘US English’ in Settings (next button)). Watch 7th grader Katie with her dog Caysie, explain LFTR. Katie’s other video’s are also really instructive. More on LFTR you’ll find here. Short (2:52) intro on Terrestrial. Men talking, not much to see. Nevertheless: a well financed startup. High probability of being the first to show a working msr, scheduled for 2024. Here’s more on Terrestrial. Longer (26:34); an amusing overview of molten salt technology by dr. Stephen Boyd.